I didn't realize how much I love Music Biopics until I started in on this post. It's funny. I often avoid them with the whole..."Great...another biopic..." line. But I always end up loving them. So many came to mind, I literally didn't know where to stop. I grew up on a couple, in particular, that I'm leaving off today. The first is the 1980 Loretta Lynn story, Coal Miner's Daughter. (Sissy Spacek is so damn good.) Also, I spent a great deal of my childhood watching the 1987 Richie Valens story, La Bamba. It came on HBO like three times a day, it seems like. Powerful flick with some great supporting turns. ...I'm breaking the three movie rule this week, Wanderer. Sorry. But it has to happen. I have a little story to tell, a story of movies inspired by great artists that inspired a great movie about a great fake artist that is followed by a movie lampooned by a movie about said great fake artist before the latter was even a glint in its maker's eye. 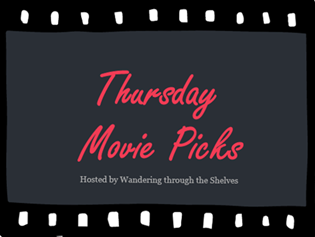 You won't be confused much longer this Thursday as part of Wandering through the Shelves' Thursday Movie Picks. I have Music Biopics for you. More than three...plus a bonus. I was obsessed with this movie way before I ever saw it. Plain and simple, I loved The Doors before I was old enough (by my Mom's standards) to see a movie of the band's rise and fall. And what a glorious portrait of Jim Morrison and his band this is. Oliver Stone was the right guy for this movie, so perfectly in tune at the time with his own goals and infectious style. Val Kilmer is really under-appreciated here as Morrison. He owns all the crazy, masters the looks, even down to the smallest of glances and shifts in posture. As I said at the start of this post, I often feel like I'm "so over" the music biopic...until I actually watch one. I almost always coming out satisfied. James Mangold's take on the life and times of Johnny Cash is no exception. This is a brilliantly well-made biopic, featuring a career-defining performance from one of our finest actors in Joaquin Phoenix. Personally, I felt like the Oscar was his, but you can't deny Hoffman's one-man show as the also real-life Truman Capote. Anyway, Walk the Line is a typical biopic, but it rises so far above in the love it so obviously has for Johnny and June and their music. And the fact that Phoenix and Witherspoon did their own singing...so good. ...somebody actually made a great Brian Wilson biopic. Now, here is a film that might have worked in last week's picks. It tells the not necessarily intersecting but parallel stories of Wilson as a young man (played by Paul Dano), making his seminal magnum opus, the 1966 Beach Boys album, Pet Sounds, and Wilson as an overly-medicated, middle-aged shut-in played by John Cusack. What Dewey Cox made such great fun of is no laughing matter here. This is a serious film about one of the great artists of the 20th Century, and the sound design team was robbed of any big discussions in movies last year. Our departed-from-the-blogging-world partner, Andrew a.k.a. Drew a.k.a. Fisti, got onto me a bit a few weeks ago when I picked this film for Love Triangles instead of waiting to pick it here. I promised him a mention, so here it is. Amadeus has been in my All-Time Top Five since I saw it the first time when I was 13. It is perfect. It tells a perfectly intriguing story of the depths of genius and passionate sins of envy and pride. It sounds perfect. It looks perfect. It is funny and sad and knows that it's both. I adore it. It is one of the few true Best Picture winners. I'm quite sure no movie was even close in '84, the year of my birth. Loved the Doors bio-so rich and Val Kilmer was excellent in the role. I also saw Walk the Line and felt Phoenix just inhabited Johnny Cash. After seeing Capote last year, I would have given the Oscar to Joaquin. I really want. To see Lve and Mercy and hope to this year. Love Amadeus!! The acting, the music, the styling...just wonderful. Walk Hard sounds quite funny. Definitely see Walk Hard. The familiarity to so many of these movies is perfect. I also chose Walk the Line and Love & Mercy. I wanted to choose Walk Hard but I wasn't sure if a fake bio pic would count, but man that movie is hilarious. Great post! Nice. It is so hilarious. Thanks! Marvelous choices even if one is a bit off subject. Kilmer was the perfect choice for the Lizard King, Meg Ryan much less so as his consort Pamela. She was actually a drag on the movie for me but Val was mesmerizing. 2005 was such a rich year in best actor with any of the five nominees worthy of the award, how often does THAT happen?, and Phoenix really makes Johnny Cash an understandable man. The picture itself isn't perfect but he is. I haven't seen Walk Hard, I've heard bad things but I'll get around to it one of these days, nor Love & Mercy, it's on my list just haven't gotten there yet. 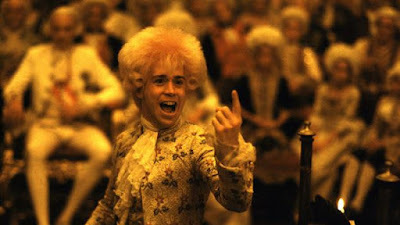 But Amadeus is an amazing film in both visual splendor and performance. I saw it in the theatre and it was almost overwhelming. Even though you didn't choose it I agree that Sissy Spacek is amazing in Coal Miner's Daughter! Wonderful choices. I'm a real sucker for musical biographies and have seen dozens and dozens through the years which made it tough when the time came to pick only three. Even when I decided to do a theme within theme and choose films about performers who fought back from a major physical challenge I still had to leave out Interrupted Melody about opera singer Marjorie Lawrence's battle back to performing after she was struck with polio. Be that as it may here's my three for the week. Sweet Dreams (1985)-Tale of Patsy Cline’s ascension from honkytonk singer to queen of the Grand Ole Opry and beyond as well as her messy personal life, including a near fatal car wreck, until her death in a plane crash. Jessica Lange was Oscar nominated for her turn as Patsy, she’s given strong support by Ed Harris as Cline’s difficult husband and Ann Wedgeworth in a beautiful performance as her mother. The Joker is Wild (1957)-Crooner Joe E. Lewis (Frank Sinatra) works his way up through the racket run nightclubs of Chicago mob boss Georgie Parker. Once successful he tries to move on only to have his throat slashed in retaliation. His voice ruined he slides into alcoholism but his former accompanist and friend helps him reestablish himself as a successful stand-up comic. The road still has many rough patches ahead though. One of Sinatra’s better lesser known performances. The film features one of Sinatra’s signature songs the Oscar winning “All the Way”. With a Song in My Heart (1952)-Young singer Jane Froman (Susan Hayward) rises from staff artist on a small radio station in the Midwest quickly climbing the ladder of success to become a top radio and stage star. Along the way she enters into a marriage of convenience with her manager which soon hits the rocks, then America enters WWII. Like many performers she volunteers to entertain the troops and is on her way to do so when her seaplane crashes into the Tagus River off the Lisbon coast. She is one of the few survivors but is severely injured, most perilously her leg is nearly amputated. The remainder of the film follows her grueling treatment, difficult recovery and return to finish the job she started. Grim in parts but overall a story of someone with tremendous fortitude in the face of huge adversity. Loaded with great music both Hayward (whose lip-syncing to Froman’s vocals is impressively realistic) and Thelma Ritter, as her steadfast nurse, were Oscar nominated. Agreed on Meg Ryan. I've never liked her at all. She is a drag on just about every movie, except maybe When Harry Met Sally. Not sure where you're getting your info, but I'm pretty sure Walk Hard is one of the better reviewed comedies in the last 10 years. John C. Reilly is damn near award-worthy, or at least worthy of high praise. It's a silly movie at times, but it is also a brilliant lampooning of the inherent imperfection of the biopic. I WOULD KILL TO SEE AMADEUS ON FILM ON A BIG SCREEN! I honestly have no idea why I haven't seen Sweet Dreams. I am a Patsy Cline fanatic. It sounds right up my alley. Your other picks sound like great '50s flicks. Would love to see the one with Frank Sinatra. Amadeus is definitely a sight to behold on a big screen unfortunately I don't think it has an anniversary coming up where it might get a special showing, perhaps a revival house might show it sometime if you have one close to you. TCM shows The Joker is Wild from time to time, as they do with Song in My Heart. One humorous note about that one: in the BIG production number for the title song Susan Hayward is dancing in a low cut gown with her partner in long shot, as he twirls her around one of her breasts pops out of her gown. Pro that she was she merely readjusted and kept on with the number and it wasn't caught and remains in the picture now. It's very quick but definitely noticable! Quite risque for a 50's film! Hilarious! I'm sure 50s audiences would've been shocked. There are zero good revival theaters around me. There may be something like that in Atlanta (4 hours away). Nashville has a place that does that sometimes (3 hours away). Anyway, I'm always on the lookout. Walk the Line was good but it's basically the white version of Ray. I've seen Amadeus when I was 12 or something and I did enjoy it. Not sure what that's supposed to mean...the "white version of Ray," but anyway...I'm sure they're both typical biopics, a genre that is limiting in itself and never perfect. I haven't seen Ray, so I can't comment. But, for me, Johnny Cash > Ray Charles. Hence, I actually saw one and not the other. Great post, Kevin. I'd actually forgotten about The Doors. Val Kilmer was terrific in that, wasn't he? And I've always loved the Doors' music. Thanks! Yes. He is so good and the movie is good and the music is great! I really want to re-watch this one soon actually. I've got a weird relationship with The Doors biopic. I've never actually seen it, but heard it several times. One of my roommates in the Army bought it when it came out on VHS...yup, that long ago...and watched it every damn day for like a month. The way the room was set up I couldn't see his TV from my side, but surely heard it more times than I cared to. After that experience ended I had zero interest in actually watching it and never bothered. I may actually do so since that was a quarter century ago. Yeah. I can imagine that would be pretty off-putting. Though, I love The Doors' music. Either way. Hearing something over and over can always get to be a bit much. It's a solid biopic. I love Oliver Stone too...almost always. Give it a shot. I really want to watch Walk The Line at some point. Amadeus is great and onmy list as well. Definitely give Walk the Line a shot, especially if you like Johnny Cash's music in any way. Agreed! I will watch anything Stone makes. I'm pretty sure I'm one of the very few that actually like Savages. It played a lot like something Tony Scott made in his last years. I dug it. But, yeah, he's pretty hit and miss for most. I've never seen The Doors and I REALLY want/need to. Walk The Line is really good, elevated by Phoenix and (to a lesser extent) Witherspoon. 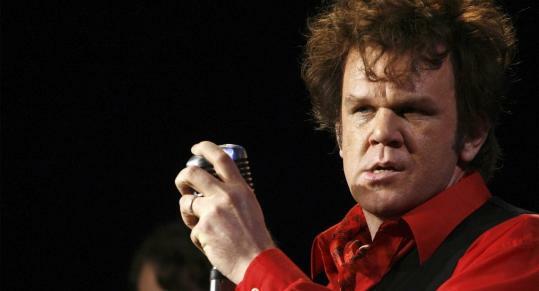 I haven't seen Walk Hard in full but I've seen clips and while I like John C. Reilly, I don't like him in that register. I'm sure it's a fine film but just not for me from what I've seen. I missed Love and Mercy last year but want to see it for Paul Dano, who sometimes gets a bad rap, and for Elizabeth Banks who I hear is amazing in it. Amadeus, though. That film is in a whole other league. Like you, I was born in '84, so it had a special significance for me even before I saw it. When I finally did, it didn't disappoint. A few years back while working for the theater, I got to meet F. Murray Abraham when he was doing Merchant of Venice for us, and I couldn't help but gush. It was almost embarrassing. Dude. Banks is incredible in that movie. Seriously. She upstages everybody. Paul Giamatti also delivers a strong supporting turn. Dano and Cusack are both great. If I ran into F. Murray Abraham, I'm pretty sure I would just freeze up, and then say something stupid. I sadly have never seen The Doors or Walk the Line. I've only watched a little bit of Walk Hard. I have seen Love & Mercy, & I thought it was excellent. And I loved that you mentioned La Bamba at the beginning. Just watched it a few weeks ago in my Spanish class. Excellent film, & it's one of my favorite biopics. But I do remember the "You don't want no part of this" part from Walk Hard. I thought that part was hilarious. I should really watch it soon. Cool connection to Eminem and 8 Mile. That's a solid movie that I haven't seen in a long time. Great picks! I've actually just added The Doors to my watch list as I don't think I watch enough music biopics. Love Walk the Line - such a brilliant film, I agree Pheonix should have won the Oscar but the oscars loved PSH. I liked Amadeus sneaking in there, again an amazing film - prompted me to check over my DVD collection and realise I don't have it so quickly corrected this. Thanks! The Doors is a must for sure. And Amadeus is a must on the DVD shelves. 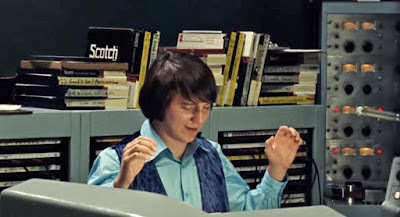 I've heard good things about Love & Mercy so I want to see it. I used to watch La Bamba quite a number of times as kid too and Great Balls of Fire as well. They got aired a lot. Love & Mercy is really a solid movie. And yes. La Bamba is all over the place. Great Balls of Fire somehow escapes me.